Some of the longest serving battleships in the world, the Gangut (or as the were known in the Russian navy - Sevastopol) class ships had eventful careers. They fought in four wars, took part in three revolutions and outlived all but one of their contemporaries while losing 50% of the class in the process. Four battleships of the class (Petropavlovsk, Sevastopol, Gangut and Poltava - named after famous Russian battles) were laid down in June 1909 and at the time were some of the most powerful battleships designed. Unfortunately their long building times meant that by the time they entered service in November 1914 British Queen Elisabeth class battleships were nearing completion, and they were becoming obsolete. They displaced 23,300 tons, had top speed of 24 knots and were armed with twelve powerful 12" guns in four triple turrets. Their guns were the most powerful 12" guns used in WWI with the heaviest shell of any 12" gun before American Alaska class in 1940s, another distinctive feature of the design was the fact that the guns elevated to 25 degrees where most of their contemporaries only managed 12 to 15 degree elevation. Their most interesting feature was the armor scheme which was uniquely Russian and was a direct consequence of the defeat at Tsushima. At Tsushima Russian ships were turned into burning pyres by the rain of Japanese HE shells hitting their unarmored sides, while even modest armor was not penetrated by them. 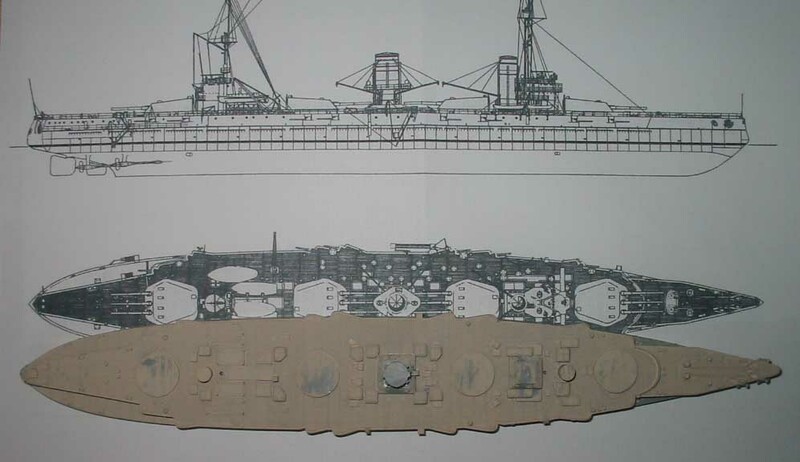 So as a consequence of that Russian navy theorized that the best way to protect a Battleship is to armor as much of the hull as possible with modest armor, so in a complete antithesis to the American All-or-Nothing scheme almost entire hull was armored, but the main belt was only 225mm thick. While this was justifiable in the view of the performance of German and British shells at Jutland, later in their careers when AP shells that actually worked appeared they became woefully underarmored. All four ships entered service within 2 months of each other in November 1914 - January 1915. Throughout WWI they patrolled the minefield positions at the mouth of the Gulf of Finland, only venturing out of the gulf twice, when Petropavlovsk and Gangut covered minelaying operations in near Gotland in Oct-Nov 1915. 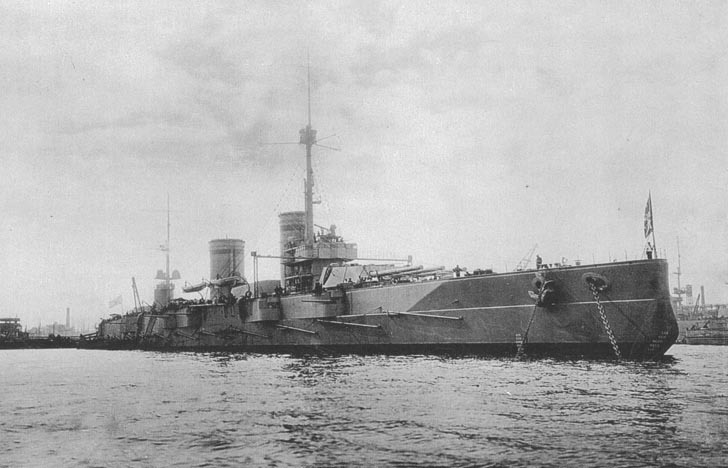 Since they were the only Russian dreadnought type battleships in the Baltic, Russian high command was very reluctant to risk them and they never fired their guns at the enemy in anger during the war. That also led to their bored crews being involved in revolutionary activities. There was a minor mutiny on board two of them in 1915 and their crews took active part in both March and October 1917 Revolutions. All four ships took part in the epic Ice Voyage in March 1918 when the ships of the Russian Navy were withdrawn back to Kronshtadt from their forward bases through the ice covered Gulf of Finland to prevent them from being captured by the advancing Germans. After that due to the start of the Civil War all but one of them (Petropavlovsk) were placed in reserve. In a tragic twist of fate the ships that never fired at the Germans during WWI, were used to fire on fellow Russians and the former allies during the Civil War. First, on 31 May 1919 as one of the few operational ships of the Red Navy in the Baltic Petropavlovsk was covering a reconnaissance of the British forces by Red Navy destroyer Azard, when they were attacked by 8 British destroyers. Petropavlovsk was able to drive them off, but no ships on either side were hit. This, surprisingly, was the only time in their 42 year long careers when any of the Gangut class battleships were involved in the ships to ship action. In June 1919 the garrisons of the two forts on the Southern coast of the Gulf of Finland mutinied against the Soviets and Petropavlovsk was involved in shelling them into submission. In August 1919 the British claimed to have sunk Petropavlovsk in a MTB raid on Kronshtadt. That myth has persisted until the end of the cold war, but in reality the torpedo missed and hit the pier next to the ship. In November 1919 the class suffered its first loss when Poltava, that has been ostensibly placed in reserve, but in reality was all but abandoned pier side caught fire and burned for over a day and half. The resulting damage was so great that despite that fact that the hull was kept around until after WWII and there were periodic half hearted attempts to repair the ship, it was never operational again. Last time the ships were in action during the Civil War was in March 1921, when they went into action on the anti-government side. In March 1921 the sailors of the Kronshtadt Naval Base mutinied, led mostly by the battleship crews, and declared their intention to start a third revolution. In the ironic change the forts that they helped silence in 1919 now fired on them on the side of the government. Despite heavy fire from the battleships (almost 700 12" rounds were fired by them), the mutiny was crushed in 8 days. 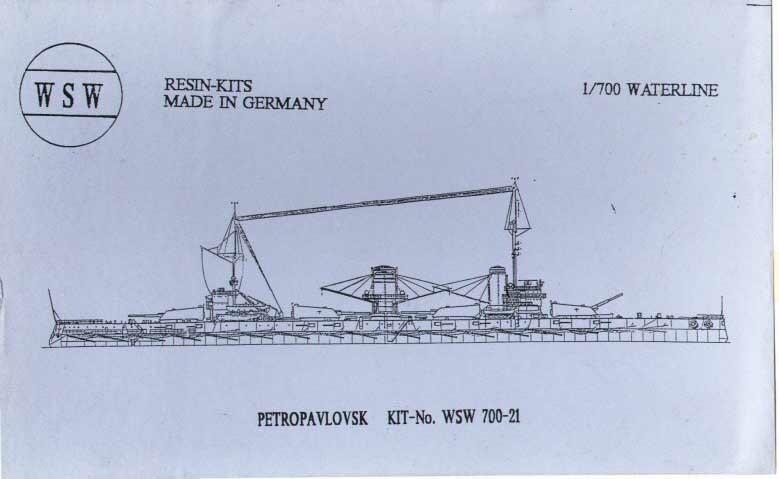 The ships were subsequently renamed - Gangut to Oktyabr'skaya Revolutsiya, Sevastopol to Parizhskaya Kommuna, Petropavlovsk to Marat and Poltava to Frunze. Next several years the ships were mostly in reserve, but starting from 1922-24 they were slowly being repaired and brought back into operational readiness. Several years of routine maneuvers followed as Red Navy was rebuilding itself. In 1929 Parizhskaya Kommuna along with a cruiser Profintern left Baltic for the last time and transited to the Black Sea (the only time the ships of this class visited and ocean). Starting from 1931 until 1938 these three ships were being slowly modernized. Superstructures were build up, boilers replaced and AA guns added. Parizhskaya Kommuna was modernized the most - mid-deck armor was strengthened from 25mm to 76mm, gun elevation was increased to 40 degrees, and anti-torpedo bulges were added which brought the displacement up to almost 31,000 tons. Baltic ships were also modernized, but to the lesser extent. Baltic ships were active during the Winter War shelling Finnish positions and coast defense batteries. Two ships fired almost 400 12" rounds at the Finns during the conflict. All three ships were active in WWII, through not in the same way as the ships of the other navies - instead of the ocean operations, they were used a floating batteries due to the nature of the conflict in the East. In September 1941 both Baltic ships were extremely active in support of the defenders of Leningrad. Marat alone fired 1042 12" shells in the span of eight days. They also faced some of the heaviest air strikes faced by any ships during WWII, each sustaining several damaging but non-disabling hits. On 23 September 1941 Marat was hit by two 500 or 1000kg bombs, which pierced the deck armor and caused the explosion of the forward 12" magazine. The entire forward third of the ship was destroyed, 326 men died and the ship settled to the bottom of the harbor (which fortunately was only two meter below the bottom of the ship). Yet amazingly two aft turrets of the ship remained operational and on October 31 they were back in action. By mid 1942 the #2 turret was also repaired. Both ships were active throughout the Blockade and Oktyabr'skaya Revolutsiya was the last ship of the class to fire its gun in anger when it shelled Finnish positions on 9 June 1944 (and obtained two direct hits on the concrete strong points at the distance of 30,000 meters). After the recent IPMS UK Nationals I had a great pleasure to spend several days at Jim's house. Both of us being avid Russian navy enthusiasts we couldn't help but talk about the ships (and their models) of the Russian navy. He let me look at his vast collection of un-built ship kits. Among them were four different kits of the Gangut class, which I couldn't help but put side by side. Below are the sad results of that comparison. In this review we are going to concentrate on three things - hulls, turrets and stacks since everything else is a) specific to each ship and b) is relatively easy to scratchbuilt if needed. * Both of the modernized ships had a length of 181m. 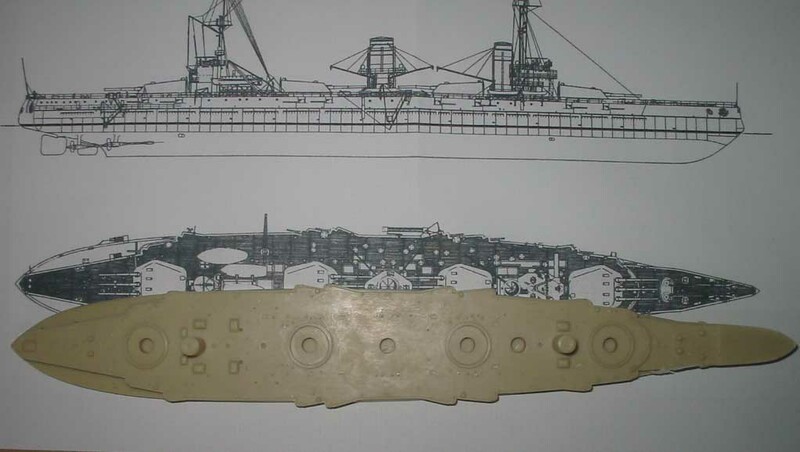 ** ParKom had bulges added in 1938 and in the fit as depicted in the kit the waterline width was 29.2m. *** Freeboard was calculated by taking the overall height of the ship - 14.26m and the displacement - 8.62m at standard displacement and 9.29m at normal displacement, so numbers anywhere in that range would be acceptable. As can be seen from the above table this hull is undersized in every dimension, but looking at it with a naked eye, it is perhaps the best hull proportion vise. 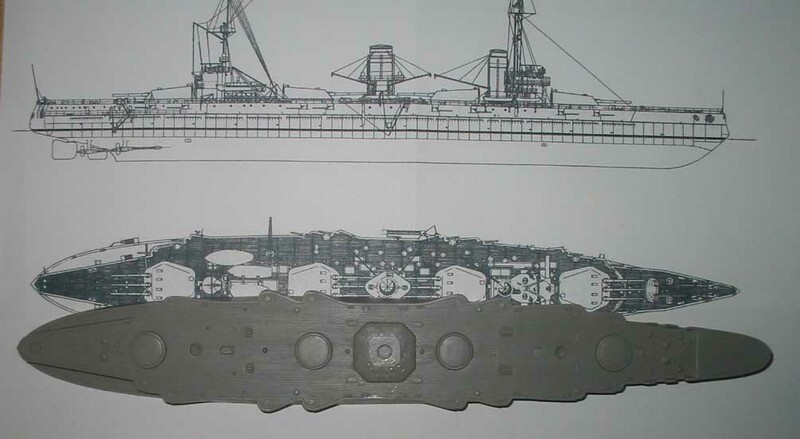 The narrowness of the waterline can be fixed somewhat by adding an armored belt which is omitted from the kit (about 0.5mm on each side), which would bring the width up to 35.5mm or 1/757 scale, still too narrow but in proportion with the deck width (it seems the master maker forgot about the tumblehome and used the deck plan for the waterline outline). When put against the plans scaled down to 1/728th the ship lays down perfectly with everything being in the right place except for the forward barbette, which is about 2mm too far forward. The detailing on the hull is rather crude and simple (it being one of the early Kombrig kits), but it is relatively easy to fix. The deck planking is simulated, but the cross deck planking is not (which is good, since it is easy to simulate using Jim's technique of simply drawing them with a pencil). Overall this is a best hull, if you do not care about the scale. The dimensions of this hull are all over the place. the waterline width is mitigated by the fact that bulges are not represented at all. 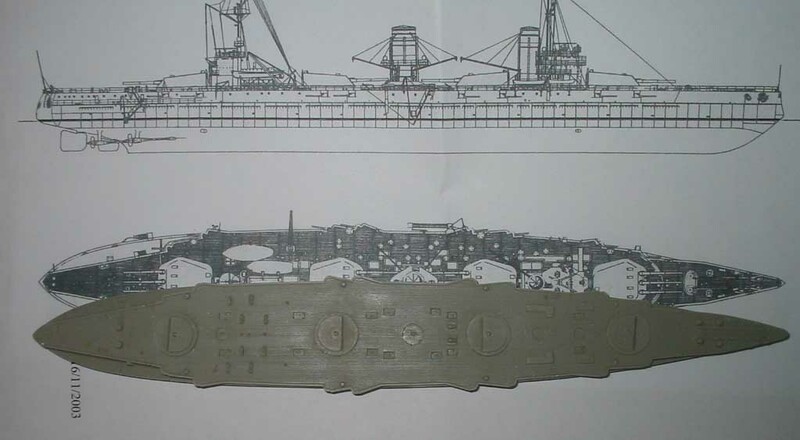 If we were to consider the width as the pre-bulged hull width it would scale out to 1/700 and then the bulges would be easy to add. 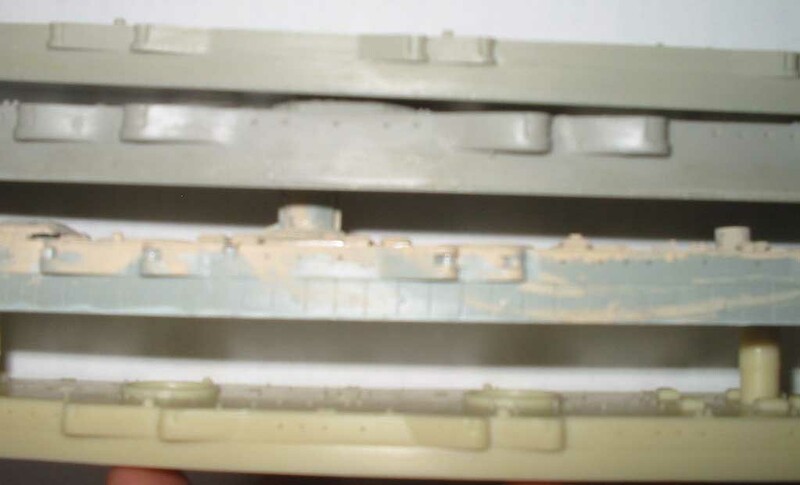 The hull is also way too tall - 10mm instead of 8 at most, the problem being that both the casemates and the belt are too tall and would be almost impossible to fix. However even if the dimensions are fixable hugely exaggerated casemates, that are also in the wrong place would be much harder (almost impossible) to fix. The same goes for the bow, which is too fat and round and the deck features most of which are not even remotely in the right place. The deck planking is simulated, but the cross deck planking is not. The detailing of the hull is also very crude, so it is by far the worst hull of the bunch. The best detailed hull of the bunch, with lots of detail, most of which is in the right place (between the forward and aft superstructure, aft and forward of that it starts getting stretched). Unfortunately it is very heavily rendered, heavy enough to remind me of the famous Matchbox trenched on their aircraft kits. The hull is also oversized, which makes it look too massive, including being too tall (1mm over the lightest draft freeboard, which is noticeable) and too wide at the deck. Both the deck planking and the cross deck planking is simulated, but it is so deep that they look like trenches (especially on the cross deck planking). With all of its problems it is still the second best hull of the bunch. The most disappointing hull of the bunch, mostly because it came so close, only to screw-up in a major way. It is the most accurate dimension wise hull of all four. Even the height of the hull is right, since Okt Rev was heavily loaded during the refits and sat low in the water. The too wide deck, looks ok as well. The shape of the modified bow is also correct. The deck detail is very well done with lots of fine details, most of it being in the right place. Unfortunately it is all wasted by the fact that THERE IS NO DECK PLANKING!!! This would mean that the entire deck would need to be re-scribed, meaning that all of the nice deck detail will have to be destroyed and rebuilt. How could they make this mistake is beyond me! This instantly drops this hull for me to the level just above the grossly inaccurate PP hull. While none of the turrets are completely accurate, The turrets from OR and GG come the closest. GG turrets is a bit (about 0.5mm in 1/728 scale) too short , while OR turret is a bit (about 0.5mm) too long and both have slightly too sharp of an angle. However all of those problems are very easily fixed with a few swipes of a sanding stick. The overall shape of the above two turrets is almost right on target. PP turrets are way too narrow in the back which means that you would have to build up the aft parts of the turrets, which is time consuming. PC turrets are completely wrong, the relationship of the turret plates is reversed and the roof of the turret is flat instead of having facets like a real thing. While it is possible to fix the question to ask would be, why bother? The stacks on GG are a bit too small in diameter, but since they are simply round tubes they are easy to replace, and even if not replaced would look OK. PP stacks look right on target. PC stack is a fat piece of junk, which is too fat and has a wrong shape too boot. 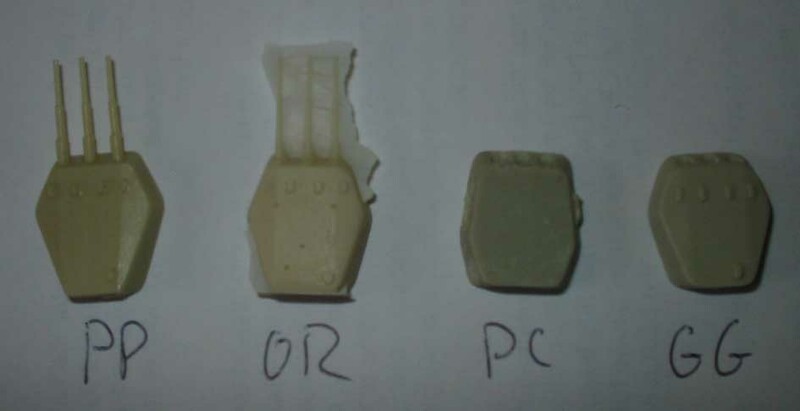 OR stack is pretty close, but it looks a bit too thin, and the example I saw was badly molded on one side, which can be fixed but would destroy the fine detail present on the stack. As you can see from the above, sadly, all of the kits are pretty badly flawed. If you want a truly accurate 1/700 scale Gangut class battleship you will have to scratchbuild it yourself. 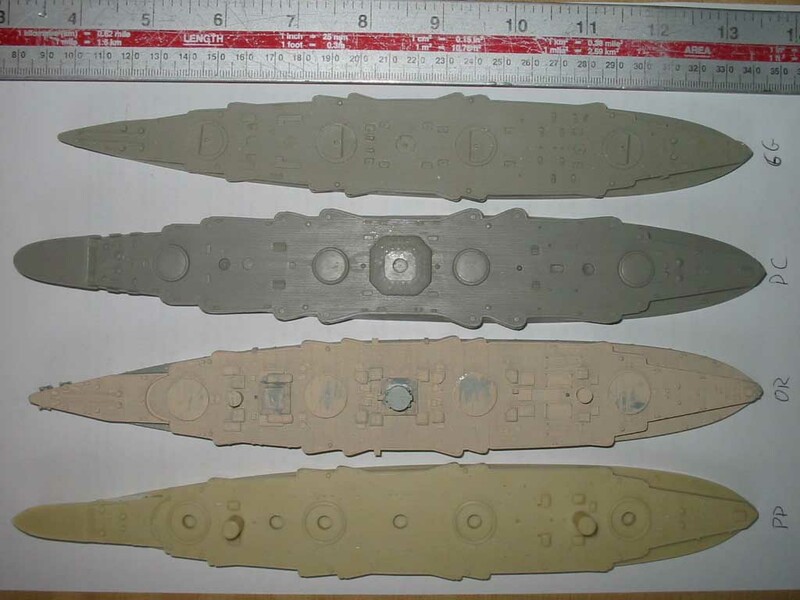 Of the four kits, I think that Kombrig Gangut comes the closest, if you don't mind the 1/728th scale. It has the most accurate proportions and details. WSW Petropavlovsk comes in second, especially is you factor in the price, which is twice as much as Gangut. It would probably be the fastest built out all four, since extra detail would have to be added to Gangut to bring it up to par. Two of the modernized ships are junk. HP Okt Rev would have been the best kit of them all, but for the price that HP want for their kit, to have to do all the extra work is outrageous. Recommend it only if you don't mind redoing the deck and all of the deck detail. Kombrig Par Kom is just a piece of junk with no redeeming features, avoid it like a plague.